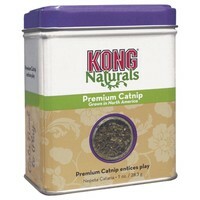 Kong Cat Natural Premium Cat Nip contains the highest potency available and guarantees maximum excitement for your cat. Kong Cat Natural Premium Cat Nip is grown in North America and stimulates and encourages cats to play. The bright, green, leafy contents can be applied to scratching posts and toys. The re-sealable container ensures potency and freshness. Our cats love this catnip more than anything else, including food! The plastic jar makes it easy to dispense and it lasts a long time, so is great value.